Gallery Delaive proudly presents "Bright wind, another step" a solo exhibition by Japanese artist Ayako Rokkaku and her fifth solo show at Gallery Delaive in twelve years of representing the artist. The exhibition presents new, never before shown, works from 2017 and 2018 on canvas, cardboard and Louis Vuitton trunks. During the opening weekend of May 26 and 27, the artist will paint live in the gallery. Rokkaku's iconic style features large female figures with candid facial expressions full of character. Vivid colored backgrounds, littered with flowers, tiny figures and rainbowlike smears compose a colorful and happy, dream world. 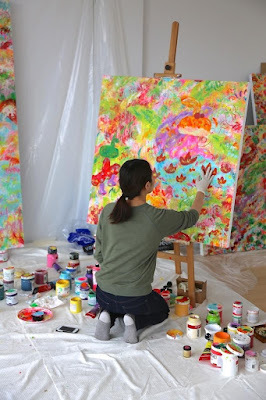 Her unique technique, directly applying the acrylic paint to the canvas using her fingers and hands, is easily recognizable in the dynamic and lively compositions. Not limiting herself to traditional media, Rokkaku just as easily transforms pieces of used cardboard and vintage Louis Vuitton Trunks into colorful works of art. With "Bright wind, another step" Rokkaku encourages the viewers to face the future. "If we feel the bright wind, we can step towards it. If we step forward, we can feel the bright wind," Rokkaku said. For Rokkaku painting is like taking a walk without a plan. "When I paint I feel energetic and bright. It makes my feelings clear and makes me want to step forward. I hope people see my paintings and feel the same way," Rokkaku said. Winning an important prize at the Geisai, a fair for upcoming artists in Japan organized by important contemporary artist Takashi Murakami at the beginning of her career in 2006, one can nowadays easily draw comparisons with some of Japan's most important artists of the moment, like Yoshitomo Nara. Born in 1982 in Chiba, Japan, Ayako Rokkaku now lives and works alternately in Berlin, Porto, Tokyo and Amsterdam. Since 2006 Ayako Rokkaku has had exhibitions in numerous galleries and on art fairs in Asia, Europe and the U.S.A. and solo exhibitions in the Kunsthal museum in Rotterdam, The Netherlands and the Meulensteen Danubiana Art Museum in Slovakia, attracting thousands of visitors. Ayako Rokkaku is proving to become an important name within the Japanese contemporary art scene.